Starbucks just released their new Sous Vide Egg Bites. I went and tried one they are amazingly good. I had to rush home and make them myself in the Sous Vide. Most of you know I am obsessed with Instant Pot recipes. 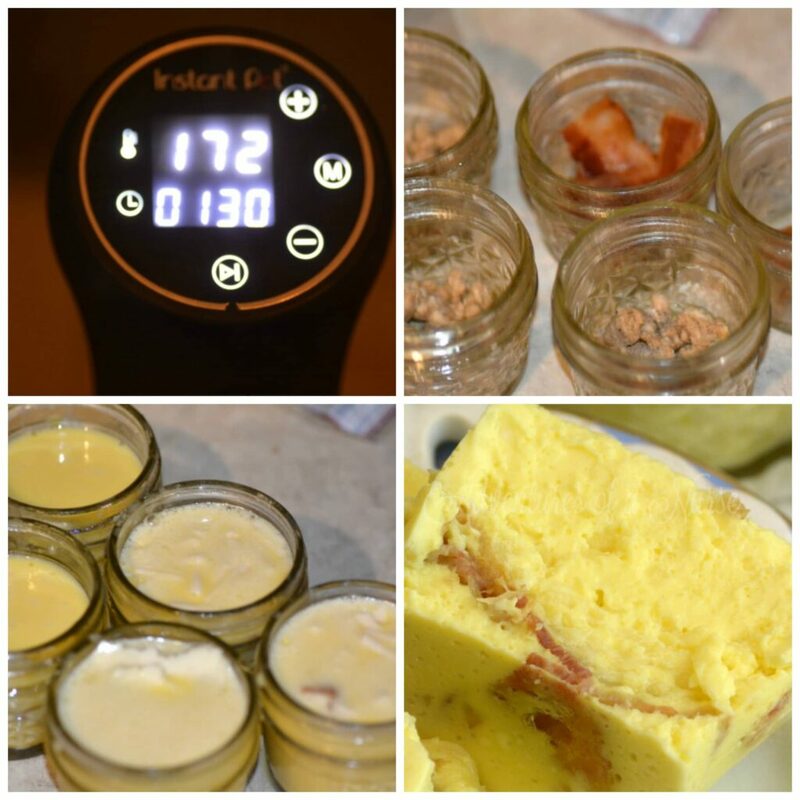 So I was lucky enough to be able to test out a Sous Vide from Instant pot. I will be bringing you more recipes for the Sous Vide also. These eggs are done to perfection. The flavor of bacon and cheese is in every single bite. I can honestly say these are the best eggs I have ever had. I have tried making the eggs in muffin cups before I never liked them. They always are dried out and too eggy. These are perfect to make ahead and pop in the microwave for breakfast on your way out the door. Directions: Turn on your Sous Vide Set it to 172 degrees. Next Wisk your eggs and milk. Spray each mason jar with cooking spray. Place a piece of meat and some gruyere cheese in the bottom. Pour egg mixture into each one. Top with Monterey jack cheese. Seal the jars with lids. Place in the Sous Vide submerging in water. Cook for 90 minutes. Remove and serve. You can also Freeze your egg bites and heat in the microwave for 1 minute. Enjoy. Turn on your Sous Vide Set it to 172 degrees. Next Wisk your eggs and milk. Spray each mason jar with cooking spray. Place a piece of meat and some gruyere cheese in the bottom. Pour egg mixture into each one. Top with Monterey jack cheese. Seal the jars with lids. Place in the Sous Vide submerging in water. You can also Freeze your egg bites and heat in the microwave for 1 minute. Enjoy. You are speedy fast! I was so happy to see this when I googled searched. What size mason jars did you use? So, thought I’d go all hispter and not pop these guys out of the mini ball jars. Mistake when not using Pam or an organic Pam alternative!!!!!! Getting the baked on eggs off the jars (even after TWO Heavy Duty wash cycles in the dishwasher!!!) was A LOT OF HARD WORK!!!! The main reason (other than taste!) to mass produce these on the weekend is EASE AND SIMPLICITY!!! If you do not use a base to make them pop out of the jars easily, you are in for an effort! Not a deal breaker, because, YUM!!! !, but a toothbrush, dawn,+baking soda is NOT my idea of EASY!!!! Also, does anyne know if you can re-use the lids to make another batch? I see on canning blogs, that the lids are one-time use only, but think this isn’t a similar application? I just have a plastic tub container to soak the jars overnight. Wipe them with sponge next day and put in dishwasher. I do that before I heat the next morning souvide bites in microwave, so I won’t mix them up in the plastic tub. Did you seal the jars with a vacuum sealer or just by closing the lid? I love these at starbucks so I loved finding this recipe. I do not have a sous vide and also googled how to mock it. I used my calphalon large pot with basket and frequently checked temp and stirred water. Otherwise followed the recipe as stated but doubled to use 12 jars. I also used soy milk. Results were good but I feel like it turned out more bland than starbucks. They are very moist and look awesome but maybe aged cheeses would add some flavor. I think the Sous Vide helps a lot to keep the flavor in. You mentioned using your instapot as your souls vide. How did you do that? Want to use my instapot instead of buying a separate appliance. Would you share what appliance you used? Good recipe. these is not eggs but cottage cheese! I wonder what adding cottage cheese to this recipe would do. Also, the one time I tried these at Starbucks they seemed lightly seared or toasted on the outside. Any insight as to the best way to replicate this? A quick toss in the frying pan? The “sear” you see from Starbucks is from the oven cooking the egg bites which are refrigerated. They cook in specialized ovens for +/- one minute. The closest appliance I have found that cooks food like Starbucks or Starbucks food if you buy it and cook it at home is the Phillips airfryer. Use the grill pan and heat in the airfryer at mid temperature for the same appearance. The airfryer does NOT dry out for like an conventional oven does. Tried this morning- VERY good! Thank you. Hi, do you have to have the machine or anyway to make this in the oven?? Or IP? how can I make these in the instantpot?? These are amazing. I’ve made them a few times already… three Sundays in a row! This last time I doubled the recipe and made a dozen so I could freeze a bunch. I’m not sure what was different about mine, but when I reheated one of them in the microwave, the texture was so gross. It was like a firm sponge. So much different than when they are refrigerated and reheated. How did you freeze yours? I had one right when they were done and they came out perfectly. So, I was bummed that I had to toss out 11 of the dozen I made. The texture was so off-putting, I couldn’t eat them. If you used milk remember it has water. When you freeze them the molecules condense. Once you unfreeze then cook them in the microwave, the molecules expand quickly giving the spongy texture. You could try letting them thaw thoroughly allow the water molecules to expand slowly and then heating then in the oven wrapped in parchment paper to steam them. Unwrap and broil for a few seconds to give the finished appearance and taste. Or after unthawing pop them in an airfryer if you have one. Thanks so much! That makes sense. 🙂 That texture was pretty awful, so knowing what happened definitely helps. Another blogger (wellness mama) say : less cook for freezer bites ( 10 min less). Then complete cook in microwave oven when need to eat. Also use cottage cheese! and mature cheese. muuuuah ! Does anyone know how one would make these in an IP without the attachment? So want to make these!!! I just bought a sous vide machine and this is the first recipe that I am trying. They are in the water as I write this. I have a dumb question… you say to set the sous vide fir the correct temp. Am I correct in assuming that the water needs to come up to the correct temp before you put the jars in the water? My sous vide doesn’t have a lot of instructions with it. Are people bringing the water to temp and then putting the jars in…. I did it that way once… but just now blew the bottom out of 2 jars by putting them in the hot water…. they are ball jars. Delish thanks. Have you done a nutrition card for these? Should we assume that that stats are about the same as the real Starbucks ones? If you put the mix in mason jars and seal them, then put the sealed mason jars in hot water, don’t the mason jars break or even explode? Are the mason jars submerged? I just made these from your recipe this morning…AMAZING! 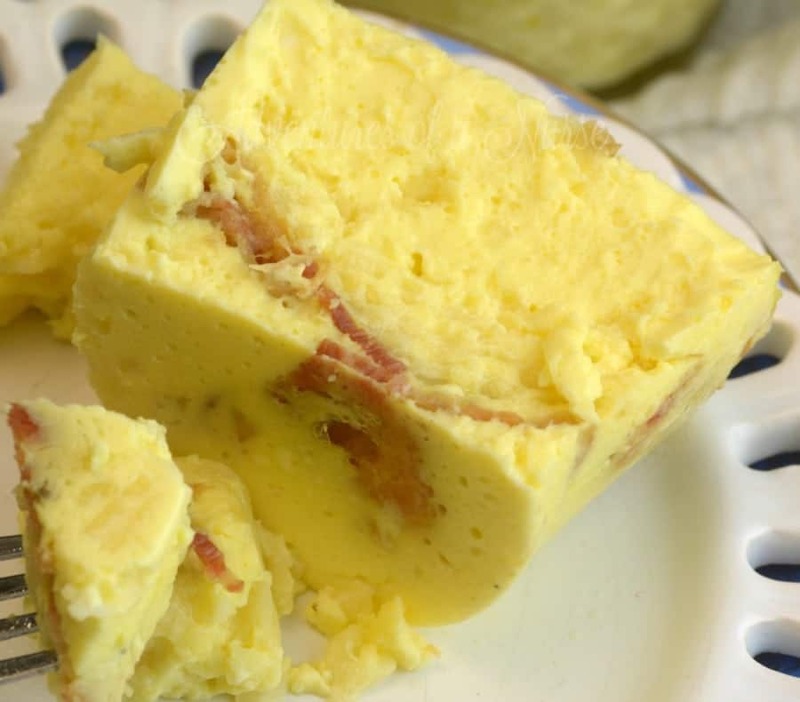 Do you think this would work if you made one giant egg bite, as in a frittata? 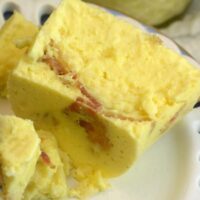 Do you think this would work as a giant egg bite, frittata style? you can also make these without a sous vide. just bake them in the oven in a water bath. I put a tin foil “lid” over each custard cup. Baked them at 170 for about 90 minutes and they turned out great! They will be great for those 12 hour night shifts.